PPHS senior Josh Wamsley gives the Big Blacks a 6-0 lead, during a non-conference bout with Spring Valley on Friday in Point Pleasant, W.Va. But, at least the Big Blacks scored. 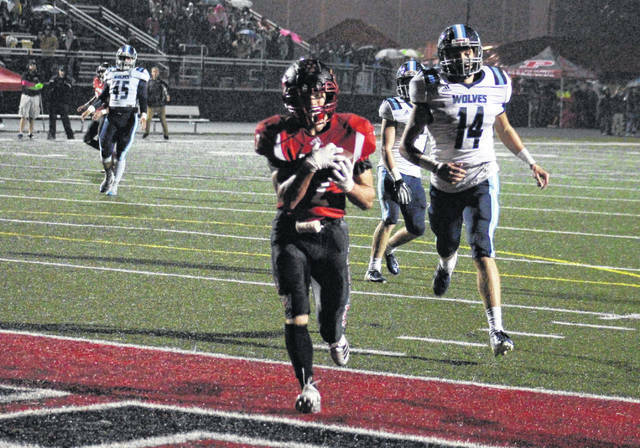 Unbeaten Spring Valley — the top ranked Class AAA team through nine weeks — handed Point Pleasant its first setback of the 2018 season on Friday night with a 58-34 decision at Ohio Valley Bank Track and Field. The Big Blacks (7-1) built a 27-14 halftime lead, but the Timberwolves (9-0) hunted down the hosts in the second half after making a 44-7 surge that turned a two-possession deficit into a commanding 24-point triumph. Hannan (0-8) dropped its 13th consecutive decision with a 43-0 setback to visiting Parkersburg Catholic (8-1) on Friday at the Craigo Athletic Complex. The Wildcats are now 0-13 all-time against the Crusaders. Wahama had its TVC Hocking season end on a bitter note after dropping a 58-0 decision against host Trimble on Friday night. The White Falcons (1-8, 1-7 TVC Hocking) host Buffalo next Friday at 7 p.m. The Big Blacks return to action Friday night when they host James Monroe for a 7:30 p.m. kickoff. Hannan travels to Tolsia to wrap up its 2018 campaign on Friday night at 7:30 p.m.
It’s the first time since Week 7 of the 2017 campaign that all three Mason County teams lost a football game on the same night. Due to an early deadline, the Mason County football games from Week 10 will be available in the Tuesday sports edition of the Point Pleasant Register. The game stories will be available online at mydailyregister.com before appearing in print.